Huge Savings Item! Save 12% on the 3 packs of Banana Chips, Crispy Banana by Mae Napa, Healthy and Delicious Snack. Premium quality snack from Thailand. (35 g/pack). by Mae Napa at Good Time Donuts. Hurry! Limited time offer. Offer valid only while supplies last. Ingredients: Banana (69.9%), Margarine (12.8%), Sugar (12.8%), Palm oil (4.5%). Ready to eat, high quality & delicious fruit snack. Storage: Once opened the product should be consumed immediately. Leftover portions can be stored in an air-tight container and kept in a cool, dry place. If you have any questions about this product by Mae Napa, contact us by completing and submitting the form below. If you are looking for a specif part number, please include it with your message. 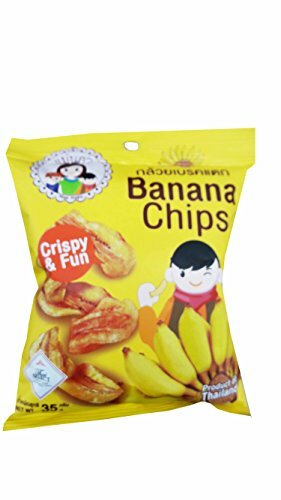 5 packs of Banana Chips, Crispy Banana by Mae Napa, Healthy and Delicious Snack. Premium quality snack from Thailand. (35 g/pack).